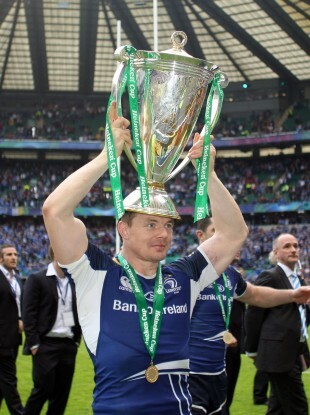 O'Driscoll was part of Leinster's transition into Heineken Cup heavyweights. BRIAN O’DRISCOLL HAS changed greatly as a player and a person since his Leinster debut in 1999, while the province itself has equally seen an utter shift in mentality and performance in that time. The legendary centre has been an integral part of Leinster’s journey from a side seen as having a weak underbelly to one that claimed three Heineken Cups in four seasons from 2009 to 2012. O’Driscoll’s maturity allows him to reflect on the important factors in the transformation, with the 35-year-old’s every answer linking back to the talent he believes has always been present in Irish rugby. Sometimes natural ability alone is not enough though, and the 133-times capped Ireland international admits that non-playing influences played key roles in altering Leinster for the better. We changed the culture in our environment, both the set-up with Mick Dawson [the province's chief executive] and his team, as well as Michael Cheika [head coach from 2005 until 2010] and the structures he put in place, helped us grow and gave us a home. “Our mentality changed thereafter and marrying that with the talent and hard work aspect brought us to a good place. That has to be our standard for all our guys coming through the academy that see what it entails being a Leinster player and being involved in this organisation – that is the minimum requirement. O’Driscoll’s mention of a ‘home’ for the province is particularly relevant to the improvements Leinster made on the pitch under Chieka and then Joe Schmidt. Training bases at David Lloyd Riverview and more recently in UCD have been essential to the growth, providing clarity, consistency and world-class facilities for O’Driscoll and his teammates. We were nomadic back in 2003/04. Even back in the early days, I remember getting text messages as to where certain training sessions were going to be held. It could be in St. Andrews, Old Belvedere or UCD. “It was very hard to get any kind of stability when you are bouncing around like that. When we got our base in David Lloyd and come up here [to UCD] last year, we built on that and married that with the talent that was always there, and an ability to work hard for one another. Like most similar journeys in sport, Leinster suffered their fair share of hurt along the way, something O’Driscoll embraced. Losing is always a more positive facet of the game in retrospect, but the outside centre stresses that it was important nonetheless. “I am a big believer that the lows happen for a reason, to drive the desire. If you look back at the semi-final in 2003 in Lansdowne Road, when we should have been in a Heineken Cup final against Toulouse, we lost to Perpignan. “You look to ’06 when we got beaten out the gate by Munster. That fuelled the desire and you had to rely on that in subsequent games to be able to get yourself up to go the extra yard, push yourself that extra couple of percent. “I wouldn’t go back and change a whole lot. I’m glad the transition took its time and I had to live those early years. We won the first Celtic League, but didn’t win another one until 2008. In just a matter of weeks, O’Driscoll’s playing contributions to the province will be at an end, and there is perhaps a new transition ahead of Leinster. The Clontarf man believes that Matt O’Connor’s men are in good shape to handle that period with comfort. - Additional reporting by Sean Farrell. Email “Brian O'Driscoll: 'I am a big believer that the lows happen for a reason'”. Feedback on “Brian O'Driscoll: 'I am a big believer that the lows happen for a reason'”.